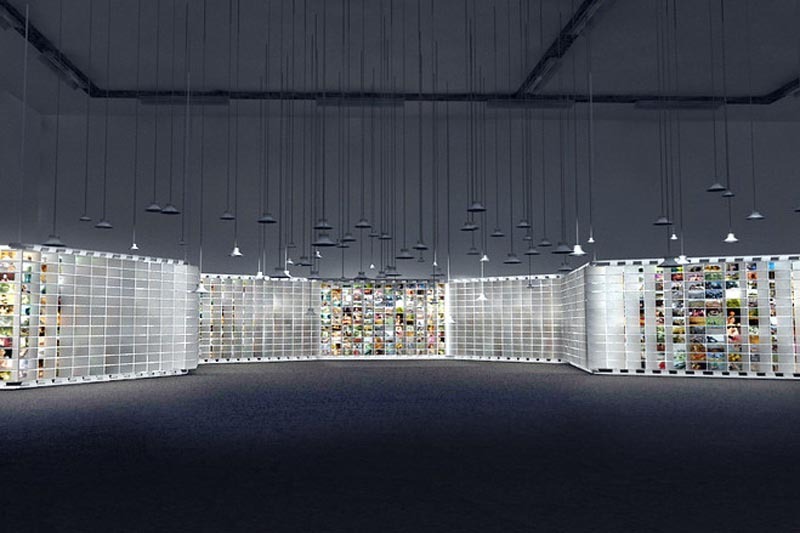 Shanghai-based multimedia artist Hu Jieming created this large-scale video piece titled 100 Years in 1 Minute. His goal was not to offer a panoramic view of history but, instead, to explore the possibilities of multiple combinations of the past century’s visual memory within one minute. Using hundreds of, what look like, shoe storage bags to frame his videos, 10 high definition projectors, and 120 loudspeakers, Jieming compressed 100 years into 1100 artworks, creating 1100 1-minute videos that deconstruct many a masterpiece of modern times. The effect is noisy, wild and humorous. Jieming sees these purely as experiments; not as art or historical criticism. Photos: artnews, bjartlab’s flickr; shanghart; and echinaart. This entry was posted in Art, Film, Interaction Design, Just Plain Cool, Pop Culture. Bookmark the permalink.